Enter the name you would like added to the towel, 12 spaces per line. If additional space is required, enter the text you would like and I will work with you to get it on the towel. If there is an issue, I will get in touch. Thank you! This embroidered golf towel is a great gift for the golfer. Premium quality towel made of 100% cotton with plush velour finish. 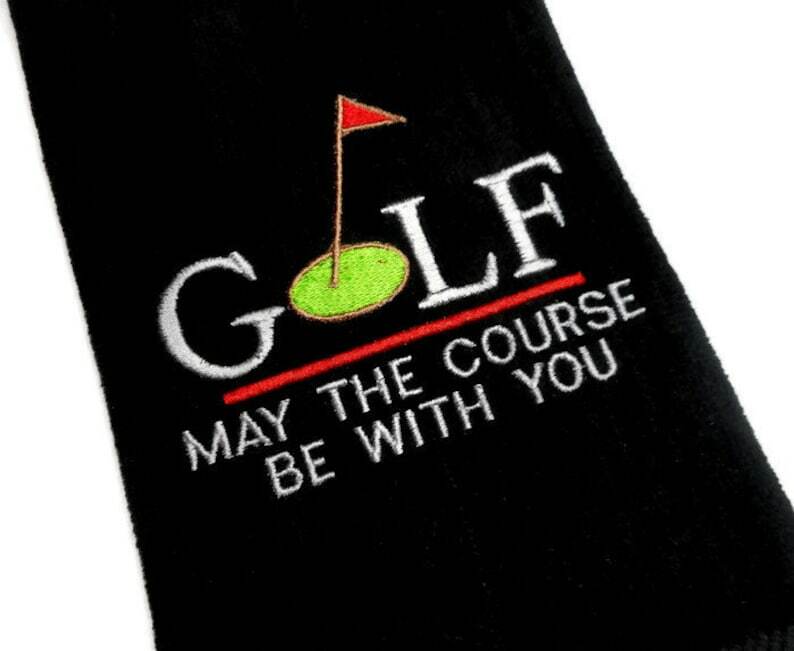 There is a golf green embroidered on this large sized thick towel and the wording, GOLF May the course be with you. The design measures approximately 3.75 X 4.75 inches, without a name. Personalization is available. Just leave the name you would like in the note to seller box during checkout. Generously sized, the towel measures 16" x 26" and has a top center brass colored grommet and hook. This tri fold, 100% cotton terry, 2-ply yarn velour golf towel is shown here in black. This towel is perfect for Father's Day, Mother's Day, birthdays, retirement...even that bachelor party last round! Designed to conveniently hang from the golf bag so it's always there when you need it! An essential accessory for every golfer from amateur to pro! I use a very high quality stabilizer on the top and bottom of my designs. Your towel will be the envy of the other golfers. If you have any questions, please be sure to reach me through the Contact on each page. You may also email me at arizonathreads [!at] outlook.com. I love custom orders and will be glad to work with you if you have a special design you're interested in. Adorable. Arrived way faster than expected, I ordered it on a Saturday and got it the next Monday! The material is thick and durable the lettering is stitched perfectly. Can’t wait to order more for all the golfers in my family. thank you AZ threads! Very cute. The owner, Peggi, was very responsive to my inquires. I had the towel I ordered in four days. Excellent service! Quick shipping...great quality and exactly as described!! Thank you! Beautiful blanket....Thank you so much!! Yes, if the item hasn't shipped yet. On a case by case basis. Please contact me for shipping fees. Also, note that customs and VAT taxes may apply to your order and that you are responsible for any/all of these fees by law. Can I use my own logo/design? Yes, but the design will have to be created/digitized and there is a fee for that service. The cost is based on the size, number of stitches, and difficulty. Please contact me for the price. Yes. Please contact me with the details you'd like prior to purchase. What if my package is stolen? Arizonathreads is not responsible for package theft. Please provide a safe place for deliveries, i.e., your work address, a PO Box, request signature, etc.